Head on you, the Lake and Miseno Cape with its Mediterranean scrub nuances. Relais Villa Oteri is located in this unique and spectacular section of the Plegrean fields. All around is history: in few minutes you could explore wonders unique in the world through an extraordinary historical and archaeological route: the Piscina Milabilis, the Augustan Sacellum in Miseno, the Aragonese Castle with the Archaeological Museum of the Phlegrean fields, the Underwater City ruins and the Archaeological Park in Baia with its ancient roman baths and the Acropolis of Cumae with the famous Oracular Grotto of the Sibyl…these are only same of the most important and fascinating sites. 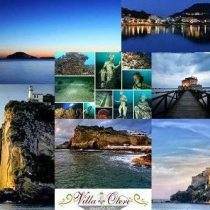 At few kilometers from Naples downtown (it will take about 30 minutes long to get there by public transportation), we will be able to offer you a stay dedicated to art and the culture through the visit to museums and churches which most show several schools of thoughts that followed one another in this splendid city. a) A warranted and obvious price: your reservation is guaranteed at the best rates appearing on the net, because there are not useless costs which increase our prices. We are the ones to manage directly our rooms availability and the advantages that you can find on our web site. b) The added value regarding our direct assistance from the moment of your reservation, to answer to your requests in the best possible way before and during your stay. c) The quality promised during your stay, because each picture and description on our web site it ‘s real. We believe that a clear relation with guest is an unavoidable value. Consulting our booking on-line system you will be able to find a rich range of promotions and rates for every period of the year, that will certainly satisfy your requirements … from the special rates with best guaranteed price to the early bookings, from the discounts for longer stays to the ad hoc packages. • Bikes rental free of charge by the Hotel. • Panoramic Restaurant where guests can taste local specialties.